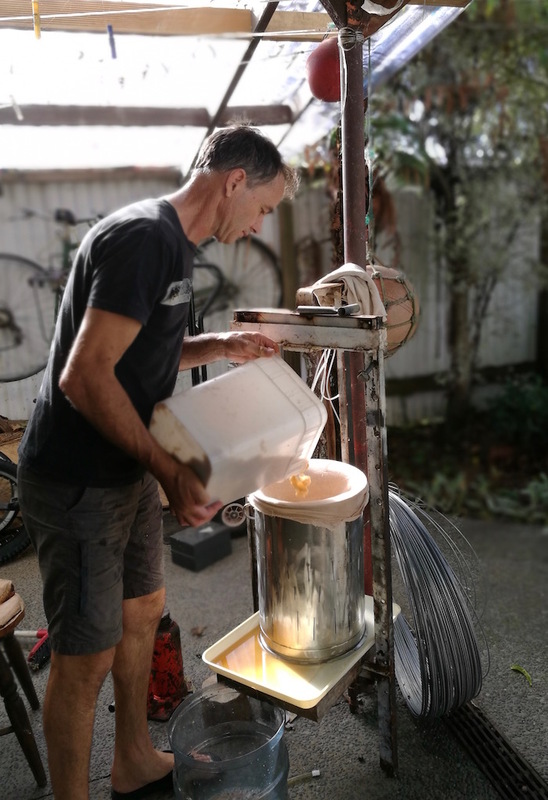 Last weekend I spent a sunny autumn afternoon making apple juice with my friends and neighbours Clare Jackson and Tim Newton. I was helping them process some of their 100kg-plus apple harvest. I was very happy to take home a 5 litre bottle of sweet golden apple juice as my reward. Tim and Clare have several apple trees in their garden. The biggest is a unique variety, which has been dubbed the “Edinburgh Special”, after the Hillcrest street. Apple experts from the Treecrops Association have said it’s not a known variety. It’s more of a cooking than eating apple. The large yellow-green apples turn rosy pink when they get plenty of sunlight. The first step to juicing: Clare quarters the apples and chops out blemishes. The Edinburgh Special was probably grown from a pip. It was a seedling in the garden, being overwhelmed by weeds, when Tim and Clare bought the property. Sixteen years ago Tim transplanted the young tree to its current position outside the kitchen window, where it has grown into a large and productive tree. Tim’s Oma (grandmother) in Switzerland used to have an apple tree outside her kitchen window, Tim says. These days Tim and Clare can look out at the tree from their upstairs bedroom, and enjoy watching the seasons passing, from spring apple blossom to ripe fruit, to bare branches in winter. 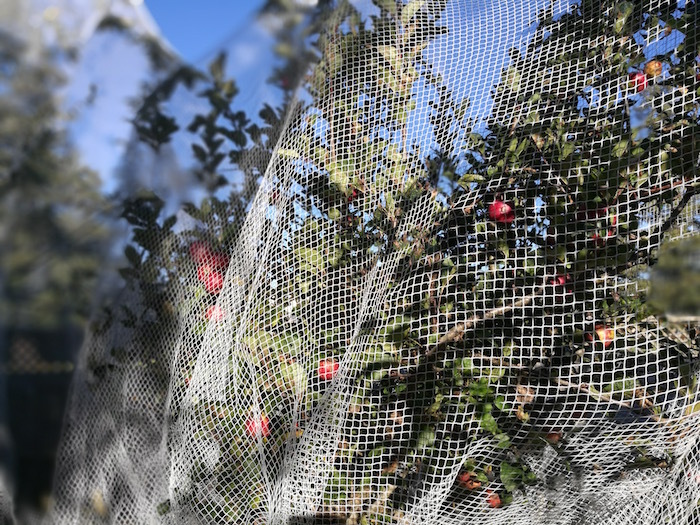 The secret to a backyard apple harvest: Cover trees with netting to stop birds from damaging the fruit. 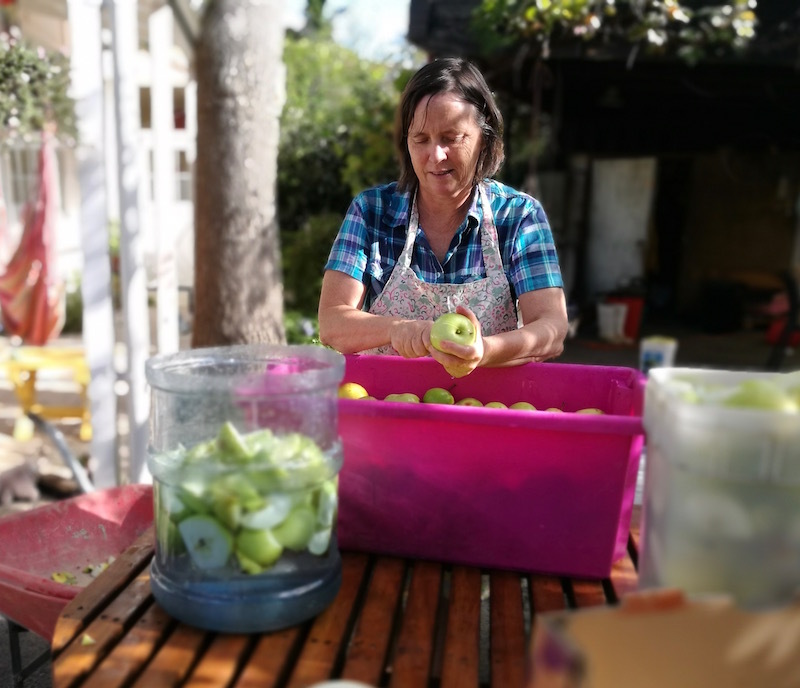 Tim and Clare’s backyard produces much more than apples – there’s an abundance of fruit and vegetables all year round. 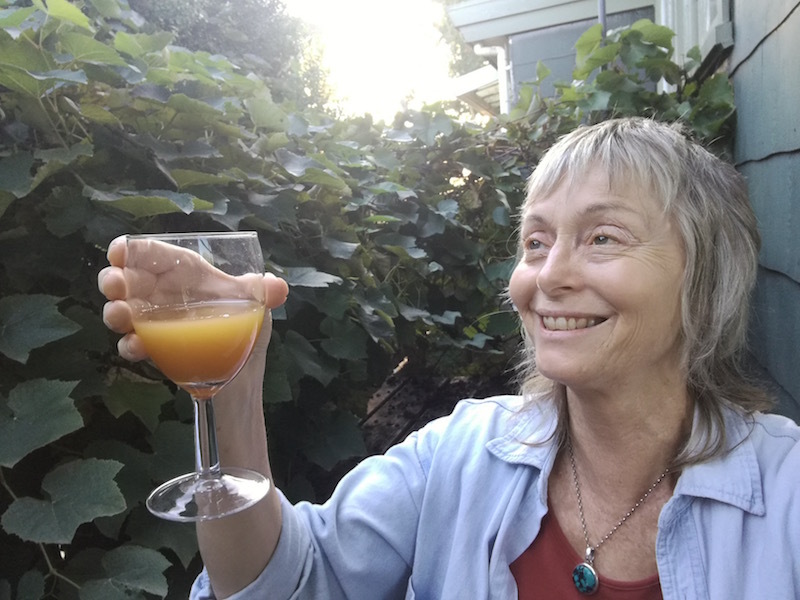 Clare designs gardens, teaches sustainable gardening and writes books and newspaper columns, while Tim is a tree specialist and helps property owners restore backyard gullies. Their family business, Green Footprint, brings together all their areas of expertise. Here’s a link to Green Footprint if you’d like to know more. And here’s a link to How to Plant a Fruit Tree, an ebook that Clare and I co-wrote. It contains everything I wish I’d known before I planted my fruit trees! Tim is also the current chair of OrganicFarmNZ Waikato, a grassroots organization that provides organic growing education and certification. When I arrived Tim was up on the roof picking apples, while Clare was organising the tubs of water and clean buckets. First we washed and quartered the apples. The cores were left in, but any rotten pieces were discarded to the compost heap. The apples were in pretty good condition this year. Tim covers the trees in netting, which minimizes bird pecking, although a few birds occasionally get through the nets. In the next stage the buckets of chopped apples are pulped, using a retro-fitted insinkerator (a kitchen waste disposal unit). Above: Tim feeds apples into a retro-fitted insinkerator, which pulps the fruit. In the third stage, the apple pulp is tipped into a press. A truck jack is used to push down the apple pulp and extract the juice. Above: Tim Newton with the apple press, which extracts the juice from the pulp. Next, the juice is bottled. Clare and Tim heat and seal the bottles of apple juice, which preserves it for several months. If you don’t do this, the juice will keep for a few days in the fridge. This year the Edinburgh Special produced something like 100kg of apples, according to Tim. Which sounds like a lot of apples for a backyard tree, but a professional orchardist would regard this quantity as pretty average. 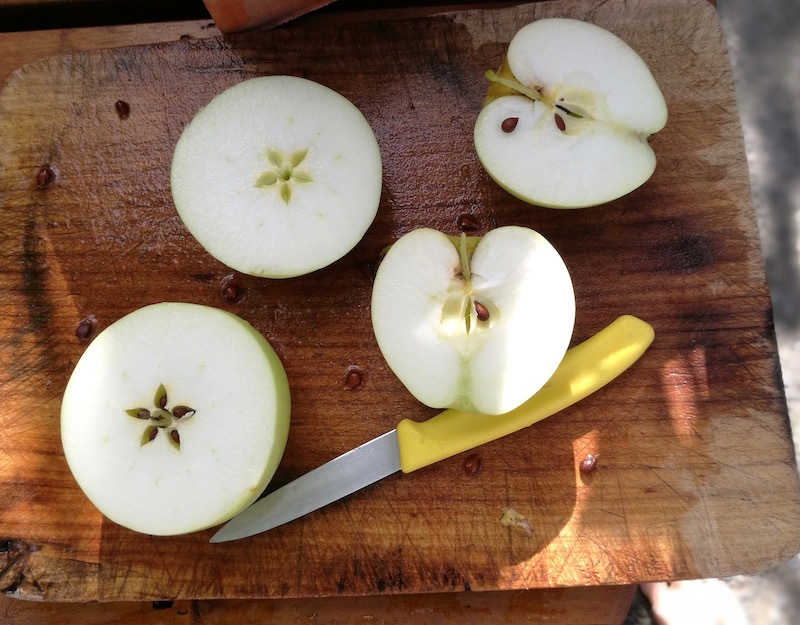 From 10kg of cut apple, after the rotten parts and bird damage are cut off, they get 9 litres of juice. 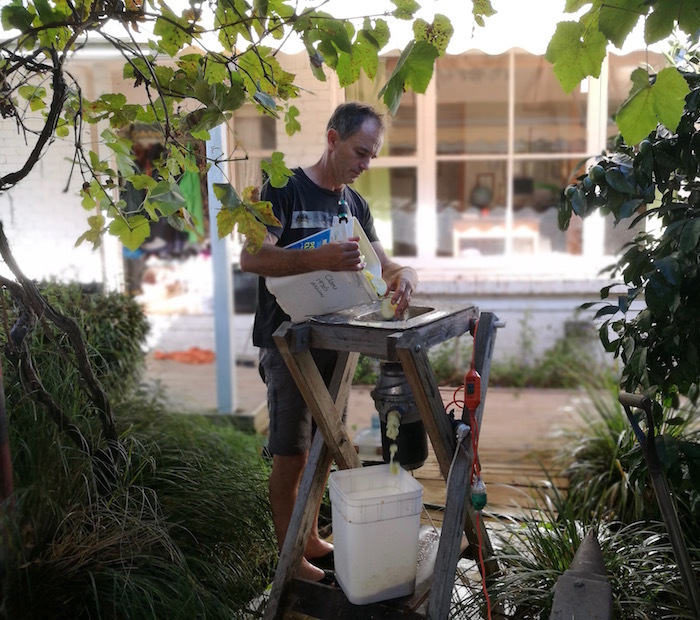 “The other day we started with over 40kg, and about 10kg ended up in the compost, and there was almost 30 litres of juice,” Tim said. Cheers! Enjoying some of the fruits of my labour. Bottle and seal the juice for drinking later. Use for bottling fruit, instead of sugar syrup. Make cider, or apple cider vinegar – here’s a link to my recipe. With sweet juice like this, you don’t need to add sugar. Just put the juice in a bucket and leave it to do its thing, and it will turn into apple cider vinegar in about six weeks! Boil the juice down into syrup to use as a sweetener. The syrup has a distinctive apple flavour – it’s great for topping porridge or pancakes. Fruit leather, using just apple or combining apple with nuts, passionfruit, feijoas etc.